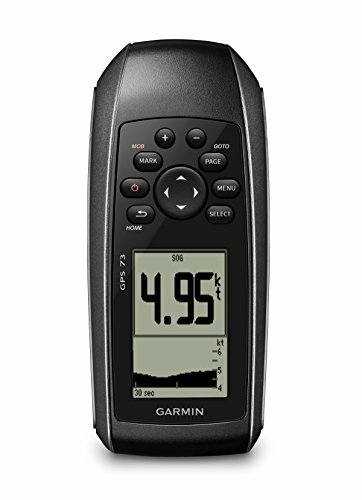 Easy-to-use handheld navigator with high-sensitivity GPS receiver marks and stores 1,000 waypoints and 100 tracks so you can navigate right back to them again. The Sail Assist feature for GPS 73 includes virtual starting line, heading line, countdown timers, speed history and tack assist. This is the perfect navigational solution for power boats, sailboats or small watercraft that don’t have a chart plotter. It’s also ideal as an important emergency navigation backup for all vessels. It even floats! Provides sunrise/sunset times, estimated time of arrival, man overboard (MOB), marine alarms and marine data. Screen and keys feature a built-in backlight, making its high-contrast display easy to read in all lighting conditions. Includes NMEA 0183 support and over 18 hours of battery life with 2 AA batteries.